The other week we had a hectic week onboard Blue Lightning Charters with two charters running in sync. 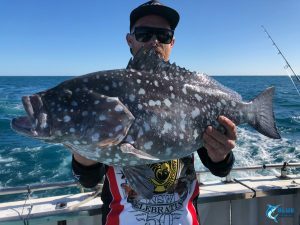 The first charter was one of our classic Montebello Islands fishing charters with a group of friends who flew all the way from Sydney NSW. 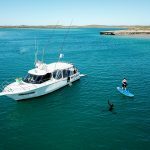 The second charter will have it’s own blog an adventure charter featuring stand up paddle boarding, surfing and exploration of the incredible Montebello Islands. We started this charter a little late after the crew’s flight was delayed, once the crew were assembled we were aboard Blue Lightning and headed towards the incredible Montebello Islands. We kicked off the charter with a normally great little Spanish Mackerel fishing spot, it was a little quiet today so we moved on. 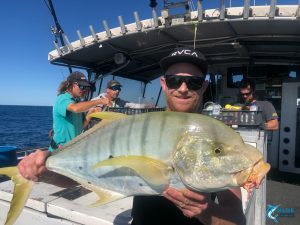 Next up it was time for the crew to try their hand at some bottom fishing, it turned out to be a great session with the crew catching Coral Trout, Rankin Cod, and some big Trevally including Gold Spot Trevally. Once the crew had their fill of bottom fishing we moved to another of Captain Chad’s prized Spanish Mackerel spots. This one was perfect and we had a crazy session! The crew managed a triple hook up to really get the blood racing and wet their appetites for aa great week at the Montebello Islands. Before long the crew decided to break out the Poppers and Stick Baits. Moose scored the biggest fish of the session a 24kg on a Green Popper by Angel Tackle. The crew managed to score three fish over 20kg with the rest of the fish weighing in at over 15kg! It was a seriously great fishing session. 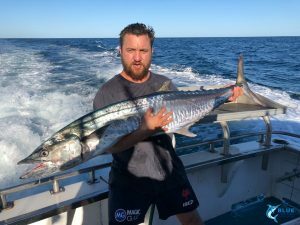 Flopp scoring 2 personal bests a 20kg Spanish Mackerel and a Rankin Cod personal best. It was a great first day at the Montebello Islands for the crew and they were excited to see what the remainder of the week would bring. We woke on day 2 of this charter to a windy day at the Montebello Islands. The crew used the morning to enjoy the Blue Lightning Charters pontoon and have some downtime and rest in an idyllic location. We decided to have an early lunch and then head out after the winds have subsided. As usual the Blue Lightning crew delivered the goods with some fun fishing and of course a couple of personal bests for the crew. On day 2 the crew scored Rankin Cod, Chinaman, Spangled Emperor and Coral Trout. 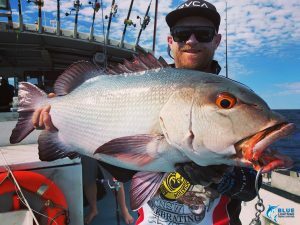 Mick was stoked to score his personal best Chinaman while Justin added Rankin Cod, Coral Trout and Chinaman to his list of species caught. It’s these firsts and personal bests that Chad and I love being a part of, the moments anglers will talk about for years to come. After the excitement and entertainment of our billfishing on day 4 my notes are a little short. 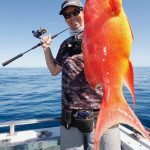 The crew had some fun bottom fishing on day 5 catching an array of fun and delicious Montebello Islands fish species. For day 6 they decided to utilise the Blue Lightning Charters fleet to the max and spent the day on board Heart Starter. She got them in nice and close to the islands allowing them to fish and explore this unique part of the world in the best way we know. Before we knew it day 7 was upon us and the crew were ready to leave the Montebello Islands and return home. We stayed in the protection of the bay for as long as we could with winds blowing a massive 30 knots as we departed. 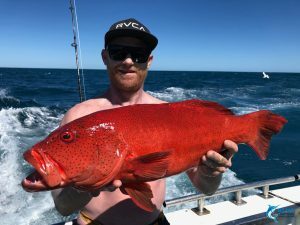 It was a slow trip back to Dampier but this crew had plenty of epic Montebello Islands fishing stories to relive and kept themselves occupied.